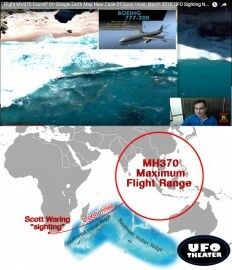 In March of 2016, online turd factory The Inquisitr indulged another Scott Waring hoax in which Waring claims to have spotted missing flight MH370. For this to be possible, the plane would have to be dragged 4,000 miles underwater across two mountain ranges, and end up on the Cape of Good Hope. In one piece. And TRANSPARENT. Obviously Waring is pretending that two converging waves found on Google Earth is the missing plane. One would assume there was a level of stupidity below which The Inquisitr and other third rate news sites wouldn’t publicize Waring’s work, but no such luck. Now again in March 2017, Waring’s scheme to shake down the corpses of the MH370 for loose change has been reborn as part of an article carried by the hoaxer’s best friend, Jon Austin of the Daily Express UK. They have no shame, so pay no attention.